Peace education, as Betty Reardon suggests, should be fundamentally concerned with the development of the political efficacy of future citizens. Political efficacy is dependent upon “sound political thinking,” “for inquiry into obstacles and possibilities for transformation should form the core of peace pedagogy, so as to provide learning in how to think and to act for political efficacy in peace politics . . .” (1) Learning how to think concerns conceptual clarity, thinking within conceptual frameworks, posing questions, rationality, and most importantly reflective inquiry. Peace education is thus closely aligned with democratic education grounded in the ideas of public reason and deliberation. A current, emergent example of democratic public reason and deliberation is the Occupy Wall Street Movement. Although in its infancy, it exhibits characteristics of democratic public reason; in particular, the process dimension of the content of public reason is exemplified in its commitment to and enactment of the process of consensus, its egalitarian openness, and its decentralized, non-hierarchical, “leaderless” orientation. In a significant way it also exhibits the public values of economic and political equality and distributive fairness as central to a political conception of justice. These elements are significant aspects of democratic public reason. 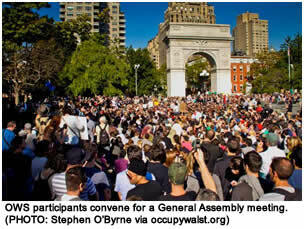 The Occupy Movement constitutes a nascent, spontaneous, and emergent instantiation of these aspects of public reason. With the Occupy Movement’s spread around the globe, it is also cosmopolitan in character. In a tumultuous time in the history of our republic, and in the history of the world, the movement constitutes a promising upsurge in democratic participation, deliberation, and public reason. At the core of democracy is the principle of government by consent. As John Dewey put it: “Democracy…. means a way of living together in which mutual and free consultation rule instead of force . . .” (2) Political consent refers to mutually recognized agreements that are reasonably justifiable (i.e., in the sense of being in alignment with interpretations of the values and principles of the political ethic) and therefore politically legitimate. Justification, rather than coercive force, is the source of political legitimacy in a democracy. The political dynamics of consent has numerous elements. A necessary core element, as Dewey’s statement suggests, is public deliberation and in turn public reason. As free and equal, democratic citizens have a civic duty to each other, what John Rawls refers to as the duty of civility, to explain and justify their political preferences and opinions to one another in the terms of the publicly recognized and accepted values and principles of the political ethic (3). It is a duty to appeal to the political ethic in the course of public deliberation; the duty of civility in fact structures a particular form of public discourse, a form of deliberation that is grounded in public reason. Government by consent, thereby, requires an overlapping consensus on values and principles of political justice whereby those values and principles are publically recognized, understood, and accepted. This ethic constitutes a “mutually recognized point of view from which citizens can adjudicate their claims of political right on their political institutions or against one another.”(4) In other words, these recognized values and principles constitute an ethical framework for public deliberation. Without reference to the mutually recognized values and principles of a political ethic and adherence to the standards and practices of public reason, public speech becomes merely rhetorical and/or ideological. Authentic public deliberation and thereby legitimate public policy require a mutually recognized ethical framework, including the standards of public reason. Public reason faces, if you will, in two directions: inward-looking toward the basic structure of the polity and its political decisions regarding questions of justice and outward-looking toward its relations with other nations and peoples. The two directions are interdependent; constitutional structure and foreign policy strategy are dynamically interconnected. Ideally, it has been long recognized that a democratic society’s international relations should proceed from a balance of the society’s values and interests. The values and principles that comprise the ethical framework’s inward and outward-looking directions should be in alignment with each other. In other words, the values and principles of a democracy’s politic ethic should guide a democracy’s foreign policy. Not only are questions of war and peace at the core of a society’s foreign policy/strategy, they are urgent matters of basic justice. Therefore, the ethical framework that guides a democratic society’s decisions regarding the use of military force should be grounded in its basic democratic values and principles (6). Democracy can be understood as a system of rights and duties premised upon the logic of equality (7). At its core is a fundamental belief in moral equality, a belief that all human beings possess an equal inherent dignity or worth. The ideal of human dignity upon which democracy is based is reflected in the principle of moral equality common to all modern political and ethical theories (8). Moral equality maintains that every human being by virtue of their humanity possesses equal intrinsic value and dignity (9). Moral equality is not earned or bestowed; it is inherent in our humanity. The logic of moral equality runs as follows: if we are morally equal, then our “rights,” our inviolable claims to the actual enjoyment of particular social goods, should be guaranteed by the society. The two basic rights that should follow from the egalitarian logic of democracy are: liberty and self-determination. If all human beings are equal, then they should have the right to define and pursue their own conception of the good life (consistent with the equal rights of others). They should have a right to decide their own interests, for their exists no higher moral authority. In addition, security of person should also be considered a basic right, for dignity and freedom cannot be fulfilled under the conditions of threat to the integrity of one’s person. A right to self-determination follows. It entails the basic notion of government by consent, which involves political equality and concomitant rights such as rights to freedom of expression, association, due process, etc. As moral equals, all citizens of a democracy have an inviolable claim to determine their own interests and to have those interests represented (directly or indirectly) in the political process(10). Self-determination also entails a right to developmental liberty, the right to the development and free exercise of one’s internal capabilities that instantiate a human life with dignity. A number of principles follow, including the principles of toleration, nonrepression, nondiscrimination, neutrality, the harm principle, among others. These principles flesh out and manifest the core values of a democratic ethic. The democratic ethic in turn should be cosmopolitan (11). Human dignity in principle transcends the special relationships defined by national citizenship. This cosmopolitan imperative is implicit in the logic of equality inherent in democracy, for both cosmopolitanism and democracy find their moral grounding in a basic commitment to equal respect for persons, a respect that transcends cultural and political boundaries (12).If the basic values and principles of democracy are cosmopolitan in scope, then it follows that a democracy’s foreign policy, including the framework it uses to deliberate or consider questions of war and peace, should be guided by this ethic. Public reason and deliberation, however, require a range of moral resources. What accounts for citizens being able to publicly respond to each other in ways that honor their dignity as free and equal citizens and human beings? While a rational understanding of the values and principles of the ethical framework and the skills, understandings and dispositions of public deliberation are necessary conditions for democratic deliberation, the development of internal moral resources are equally important. The internal moral resources — capacities and dispositions — enable one to exercise response-ability, to morally respond to others. These resources include: the capabilities of practical reason, empathy and affiliation, thinking and self-reflection, presence (moral wide-awakeness), moral judgment, and a sense of justice (a dispositional inclination to follow the duty of civility) (13). A peace education for global responsibility, consistent with the values and principles of a democratic ethical framework of war and peace, seeks to develop a deep, critically reflective understanding of a democratic ethical framework, skills, understandings and dispositions of public deliberation necessary for democratic deliberation, and the internal moral resources necessary for civic responsibility within and across the borders of a democratic society. The political efficacy, including political knowledge and skill, required for civic responsibility is based upon complex civic, peacelearning (14). This learning entails a deep, critical understanding of the ethical framework and its application in the adjudication of complex political and ethical decisions regarding the questions of justice, war, and peace. This learning is in turn facilitated by a pedagogy of reflective inquiry. The pedagogy of reflective inquiry mirrors the nature of public reason and democratic deliberation. The classroom, as do democratic public spaces of deliberation, is site of open, impartial deliberation wherein the reflective responses, proposals, visions, and ideals of citizens, present and future, are subjected to open (fully inclusive and cosmopolitan), impartial scrutiny. Through this process students develop the capacities of public reason and become adept at democratic deliberation. This pedagogy enacts the processes and substantive issues of democratic public deliberation in the classroom. 1. Betty A. Reardon and Dale T. Snauwaert, “Reflective Pedagogy, Cosmopolitanism, and Critical Peace Education for Political Efficacy: A Discussion of Betty A. Reardon’s Assessment of the Field,” In Factis Pax: Journal of Peace Education and Social Justice 5, no. 1 (2011), p. 1. 2. Cited in Steven Tozer, et al.,, School and Society: Educational Practice as Social Expression (New York: MacGraw Hill, 1993). 3. John Rawls, Political Liberalism, The John Dewey Essays in Philosophy ; No. 4 (New York: Columbia University Press, 1993). 6. Alex J. Bellamy, Just Wars: From Cicero to Iraq (Cambridge, UK: Polity Press, 2006). Duane L. Cady, From Warism to Pacifism: A Moral Continuum (Philadelphia: Temple University Press, 1989). 7. Robert Dahl, On Democracy (New Haven: Yale University Press, 2000). 8. Will Kymlicka, Contemporary Political Philosophy (Oxford: Oxford University Press, 1990). 9. John Rawls, The Law of Peoples (Cambridge: Harvard University Press, 1999). 10. Henry Shue, Basic Rights: Subsistence, Affluence, and U.S. Foreign Policy (Princeton: Princeton University Press, 1980); Dahl, On Democracy. 11. Amy Gutmann, Democratic Education, revised edition ed. (Princeton: Princeton University Press, 1999). 12. Jacques Maritain, Man and the State, Charles R. Walgreen Foundation Lectures (Chicago: University of Chicago Press, 1951). 13. Dale T. Snauwaert, “Human rights and cosmopolitan democratic education,” Philosophical Studies in Education, 40 (2009): 94-103 http://www.ovpes.org/2009.htm. 14. Betty A. Reardon and Dale T. Snauwaert, “Reflective Pedagogy, Cosmopolitanism, and Critical Peace Education for Political Efficacy: A Discussion of Betty A. Reardon’s Assessment of the Field,” In Factis Pax: Journal of Peace Education and Social Justice 5, no. 1 (2011).